Few things represent a culture as well as food. Because sweets are universal foods, they are the perfect basis for a comparative study of the intersection of history, geography, social class, religion, politics, and other key aspects of life. With that in mind, this encyclopedia surveys nearly 100 countries, examining their characteristic sweet treats from an anthropological perspective. 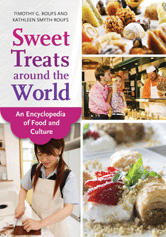 It offers historical context on what sweets are popular where and why and emphasizes the cross-cultural insights those sweets present.